Do you think that your upholstered furniture is dingy and shabby? Have you noticed its colours have started to fade? Think that it needs some refreshing? It definitely does. But what can you do about it? No, you don’t have to buy new furniture; you can keep this. The answer is very simple. You need professional upholstery cleaning. 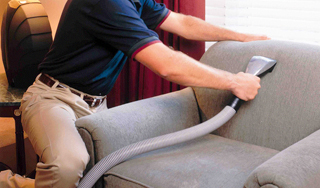 Upholstery cleaning is a type of cleaning that covers upholstered furniture like sofas, love seats, chairs, etc. It is performed by professionally trained experts who work with a variety of special machines and supplies, and the method used depends on several factors such as type of fabric and type of dirt. 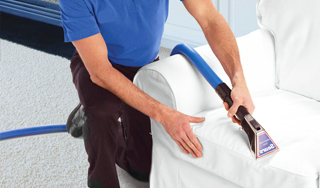 The cleaning of an upholstery item includes stain removal, refreshing, deodorising. All the dirt is extracted from the fabric with cleaning products and supplies. There are two basic cleaning methods called dry cleaning and hot water extraction. Dry cleaning uses chemical solvents to eliminate grime and filth, which is the reason why it is called dry cleaning. Whereas the hot water extraction method involves water. After the procedure, the fabric should be allowed to dry, however. Now that you know what we offer you surely think that the service is quite expensive because of all the components it involves. But it’s not. In fact our prices are very affordable and you can see what we are talking about right away by making an appointment. We opened our office in London many years ago and are now an established and successful carpet cleaning company, servicing hundreds of customers. We are confident in our cleaning system and you can be too. It is very dependable and powerful since the products and machines we use are the best and latest on the market. It is our promise to you that you will be pleased with the cleanest and driest upholstered furniture. It is very easy to say why you should pick us instead of someone else. As you can see, there are many benefits from working with our company. If it is difficult for you to believe that we possess the qualities and skills that we claim we have, you can book a service to see for yourself that what we promise you is true. Our professional cleaners are at your disposal all day long, from Monday to Sunday. You can make an appointment on the phone anytime during the day and night because we have a call centre that is open 24/7. If you prefer to book online, please, use this website.